Rob and Barb Wilson (David O. Williams photo). For Pastor Rob Wilson of Eagle River Presbyterian Church in Avon, life is a journey of prayer, family and cycling – a trinity of passions that truly makes his heart sing. Over the next three months, he’ll reconnect with all three on a sabbatical journey he hopes will take him from the heights of Mount Evans on his road bike to the hills of Tuscany and the grave of Saint Benedict. Thanks to a Lilly Endowment Clergy Renewal Grant from the Christian Theological Seminary, Pastor Wilson delivered a final sermon on Sunday, July 2 and won’t return until the final week of September. In his absence, Wilson’s longtime friend from seminary school, former private investigator, restaurateur and current presbytery executive Alan Adams will fill in. Wilson says Adams’ focus has long been on missional theology, which dictates that the church exists for the world and the community it’s in and that congregants need to “get our faces turned outward.” That’s especially important during times of national and global turmoil, he added. 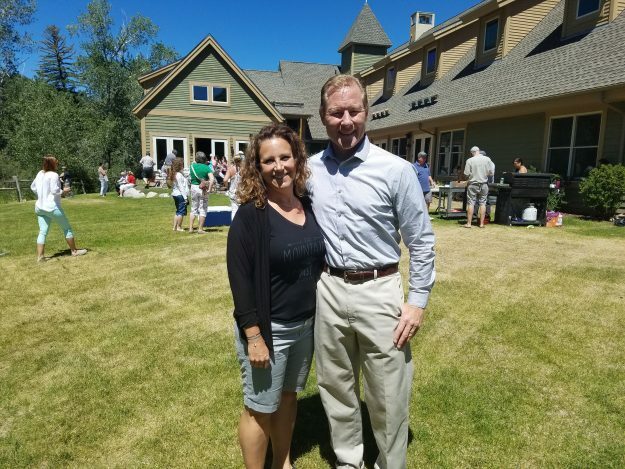 Meanwhile, after more than a dozen years of leading ERPC – including the tough transition from Minturn to its new home along the Eagle River in Avon – Wilson is ready to turn his own focus inward in prayer and outward by reconnecting with his wife Barb and their four children. In his application for the Lilly grant, Wilson was asked what things he’s most passionate about and how he could best reconnect with those aspects of his life. First, the whole Wilson clan will spend a week on the Caribbean island of Nevis, then Rob will head off on individual week-long adventure trips with each of the four Wilson children, renting a car and heading off in whatever direction they want to go. After that, Wilson’s devotion to cycling kicks into high gear. “Disgraced cyclist Floyd Landis has an inspiring quote,” Wilson said of the one-time Tour de France winner. “He once said that cycling is the monastic sport because you just spend so much time alone and in your own head, and of course he was raised in a Mennonite home and prayer was part of his life early on. After Wilson spends a week in a monastery in Snowmass and embarks on several intense bike trips in Colorado and around the region – including his first ride up the highest paved road in North America on Mount Evans –Rob and Barb will wrap up the sabbatical on a cycling tour of Tuscan hills of Italy, where they’ll visit the grave of Saint Benedict in Monte Cassino and Anzio, where Rob’s grandfather landed with the 2nd Infantry during World War II.